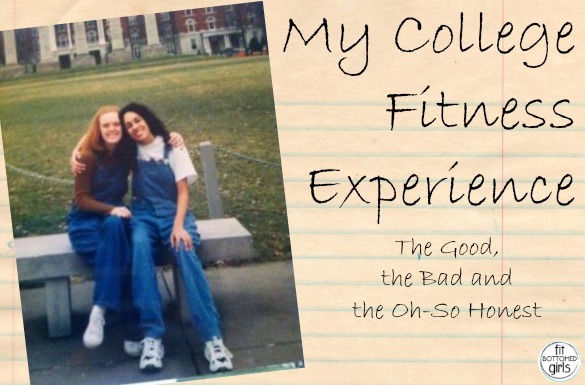 As part of the first-annual Fit Bottomed College Week, each FBG is reflecting on her fitness experiences in college. Read on for the good, the bad and the oh-so honest! I loved college. College, collegey, college. I don’t think I’d want to go through the exact experience again from a body image perspective, but I learned so much about myself (as you’ll read below) that I wouldn’t change a thing. I went to the University of Missouri-Columbia (goooo Tigers!) from 1999 to 2003, and, well, here’s my story! The good: College was truly such an awesome time for me in so many ways. I met and fell in love with my husband. I learned how to cook healthy foods for myself and experimented with new recipes by forming a cooking club with a couple of friends. I went from hating running to being able to run five miles without stopping. I learned how to write, interview people and market brands. And, I fell IN LOVE with fitness. I liked working out and playing tennis in high school, but it went to a new level in college. With a giant rec center within walking distance of my dorm room at Mizzou, I was simply taken with the number of fitness opportunities available. Classes morning, noon and night? Sports? A huge track? A pool? Weights and cardio equipment galore? And all at my disposal pretty much any time of day? Holy cow, it was awesome. The first thing I did with my new-found fitness freedom was take a kickboxing class. With a room packed of 50 girls (you had to get there 15 minutes early to get a spot) and two instructors leading us through punch-kick-shuffle combos, I was hooked. It was like I had walked into what I was meant to do—wear a headset mic, play loud pop music and tell people to move this way and that with extreme enthusiasm. At long last! I had an outlet for my dream to be a cheesy pop star (minus the singing and dancing talent that had made that dream one that was pretty far away from reality). After taking every group exercise class on the roster for a year, I finally mustered up the courage to sign up for the rec center’s class on how to become a group exercise instructor. A few months later, I had taken my AFAA-certification exam (and passed!) and landed a job teaching at the rec. And, oh, how I loved teaching classes there. It was such an amazing and inspiring environment, and it never, ever felt like work. After a year of teaching group ex classes, I decided to take my love of fitness to the next level: personal training. Working to get a group of people healthier and fitter was awesome, but I wanted to go deeper and make more of a difference. Women in class (even a few of my professors!) were asking me for individual advice on how to lose weight and what to eat, and I simply needed more training to help do that. So, during my senior year of college, I took the rec’s eight-week prep class for the American Council on Exercise’s personal training exam, passed that class and then passed the exam. From there I began training clients at the Mizzou rec center, in addition to teaching everything from kickboxing to group cycling to yoga to step. I can say that it was during college where my love for helping others to be healthier blossomed, grew and became not just a hobby but also a profession and a passion. The bad: I’ve touched on this before in past posts, but back in my younger days I wasn’t living the FBG mission. Sure, I worked out and ate healthy foods, but mentally I was a bit of a hot mess. Working in the fitness industry and amidst lots of gorgeous college girls, I felt immense self-imposed pressure to look a certain way. I thought that in order to give fitness advice and tell people what to do that I had to look P-E-R-F-E-C-T. To this end, I obsessed about the number on the scale, counted calories and often restricted my food and ignored my hunger cues. And I was well versed in the destructive yo-yo dieting cycle where you under-eat for a few days and then end up overeating because you’re starving—and then blame your “lack of willpower” on yourself, feel like crap and then start another restrictive diet tomorrow. Yeah, that’s no fun. The oh-so honest: The bad was pretty bad for me, but the oh-so honest? Well, although in no way do I condone it, in college I did party my fair share. I perfected the alcohol- and sugar-loaded slush. And I might have done a keg-stand or two—followed by copious amounts of Taco Bell. I also developed a serious addiction to Brown Sugar Pop Tarts that took me a good year to break. I still refuse to have them in my house. They’re like crack for me. I can’t believe we didn’t all rock coveralls in New Jersey last weekend. I feel like I missed out.